The following was written by Cal Shakes Costume Director Naomi Arnst. rth of the Victoria and Albert Museum announced that, at the the Costume Colloquium in November of this year, several institutions were planning a tribute to Janet Arnold, on the tenth anniversary of her death. Arnold was one of the premier dress historians of our time (her book Patterns of Fashion Vol. 3 is at right), and my hero, so, as soon as I returned home, I checked my mileage plan; I was really close to a European reward, so the plan was set. As it turned out, however, I had to fly free to Munich first. This was the first time I had ever be en to Germany and, being half German, I was right at home. It was like returning to my childhood—the food, the language, the music—all brought me back. One of my favorite things, of course, was the Bavarian embrace of the ethnic dress—it just made me giddy. Since I used to be a muumuu designer in Honolulu, it’s great to see other cultures wherein ethnic dress has become widely adopted kitsch (see photo to the right). While in Bavaria, I climbed to the Neuschwanstein Castle to see how King Ludwig II lived, and the next day did a Sound of Music foot tour of Salzburg, Austria. Salzburg was fabulous, and the locals really do wear the Tyrolean garb as day wear. The Old City takes your mind back to Mozart’s time, and earlier. Then again, my mind is known to time travel. Soon it was on to the main event: The Costume Colloquium in Florence, Italy. A nine-hour train ride later, I was there (I think I’m done with sleeper cars after this trip). The weather was fabulous the whole time in Florence; if I wasn’t in a symposium session I was walking my feet off for six days straight. The Costume Colloquium focused on several aspects of the field of History of Dress. ng-based one. This change has been directly affected by Janet Arnold’s tireless research and search for accuracy. Second, the articles themselves. Representatives from the Medici Tomb research team spoke about their most recent findings, coffins unearthed when the tomb was most recently opened. The wooden boxes had collapsed, but the bodies and clothes were preserved in mud from the river Arno in a 1960s flood. One little boy, in his fine burial suit, could not be touched, so 360-degree photography and computer imaging were used to figure out his mysteries. It was quite amazing to see the process—before computers were widely used, other Medici garments were studied with photography, drawing, painting (see Girolamo Macchietti’s portrait of Lorenzo de’ Medici at right), and lots and lots of handling. 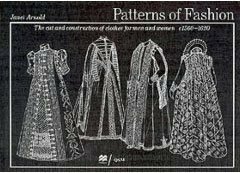 This can be seen in Janet Arnold’s Patterns of Fashion Vol. 3 (cover pictured above).re to be found in Venice, Milan, Genoa And Florence. But the 20th century is represented at the Museo del Tessuto, where we found a history of manufacturing, and how it changed dress. In Florence, the Pucci Family chronicles 60 years of Roberto Pucci’s colorful, and now timeless, designs. And we got to tour the Salvatore Ferragamo Museum, which celebrates the living legend (and which features the shoe at left). We also got to hang out in the designer’s home for a cocktail party—it was palatial, fitting for someone who got his start in Hollywood in its heyday. The last aspect of dress that we examined was documentation: Whether it be in books, online, or in exhibits, getting the information to the public is the thing. For people who love fashion like I do, we are very lucky that major galleries like the Tate Britain in London, the de Young in San Francisco, LACMA, and the Met in NY now think nothing of displaying both paintings and their corresponding dress at the same time, in the same exhibit. This is a huge breakthrough. The popularity of Project Runway has also helped fuel the dialogue of bringing the love of fashion and its understanding to the masses, and the popularity of reenactment and historical interpretation have also kept the study of dress a lively topic. 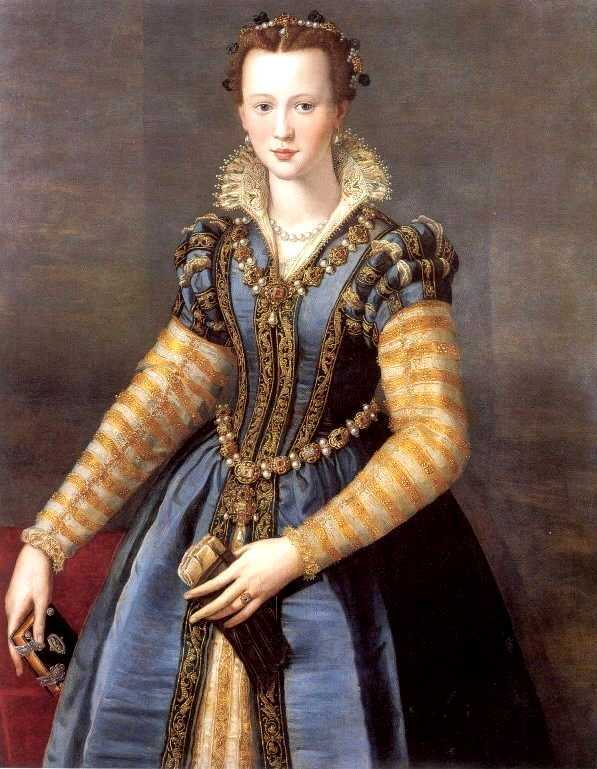 One of my last stops was a tour of the Palazzo Vecchio, the town hall of Florence and the hisorical home of Cosimo Medici, Eleonora di Toledo, and their daughter, Maria de Medici (depicited in the painting at right by Alessandro Allori). The educational staff and interpreters are set up at so that schoolchildren can put on renaissance costumes and be part of the dialogue; the Palazzo’s educational agenda is to get the public engaged in the time period, instead of just feeding it to them, so it was fun and theatrical, too.It was a great trip—I learned about advances in information gathering, computer-aided research, and much more, all while gaining a broader worldwide perspective. If you want to learn more about the fascinating group that organized the Colloquium, click here, but be warned: Navigating away from that link will dunk you into Italian-language waters. Ciao!